In the global industrial enzymes market, the demand in the proteases and carbohydrases segments is high. Together these two segments hold dominant share in the market. Increasing demand for proteases and carbohydrases in the animal feed and food and beverages industries is responsible for growth of these segments. On the regional frontier, developed regions are leading the market, as there is a huge investment in the food and beverages industries. On the other hand, Asia Pacific market is also considered as a fastest growing regional market that will boost the growth in the global industrial enzymes market. 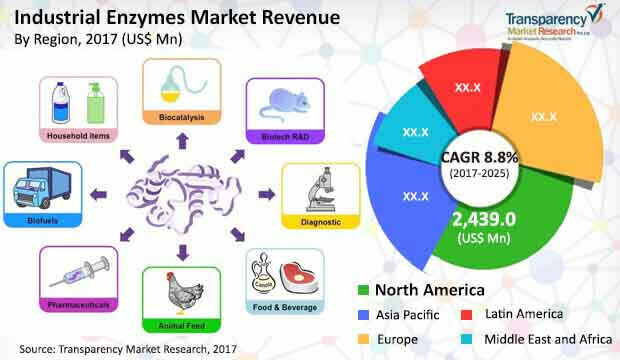 The global industrial enzymes market is expected to rise significantly in the coming years due to increasing applications in various industries. Especially talking about the pharmaceutical sector, industrial enzymes are used in producing high-quality cost-effective products. And in the food and beverages industry, industrial enzymes are used while making bakery products, wine making and brewing, fruit juices, and cheese. Moreover, increasing investment in food and beverages industry is likely to bolster demand in this market. Even in the personal care products, industrial enzymes are used for preparing toothpaste, skin repair creams, whiteners, and mouthwashes. Considering all these factors, the global industrial enzymes market is projected to grow considerably. Furthermore, growing demand for packaged food and processed food across various regions and increasing demand for bio-fuels are likely to push growth in the global industrial enzymes market. Even though, various driving factors are expanding the global industrial enzymes market, some restraints could hamper growth in this market. Strict regulations policies are one of the major restraining growth in the global industrial enzymes market. Moreover, lack of transparency in patent protection laws might further obstruct the market performance. Adding further, industrial enzymes only function under a particular ph level and temperature that also somewhere limits growth if industrial enzymes. Despite these restraints, growing application of industrial enzymes in various industries including food and beverages, personal care products and cosmetics, bio-energy, and animal feed will help in overcoming these challenges. The study presented here is based on a report by Transparency Market Research (TMR) titled “Industrial Enzymes Market (Type - Carbohydrases, Proteases, Polymerases & Nucleases, Lipase, and Phytase; Application - Food and Beverages, Personal and Household Care, Animal Feeds, and Bio-energy) - Global Industry Analysis, Size, Share, Growth, Trends, and Forecast 2017 - 2025”.